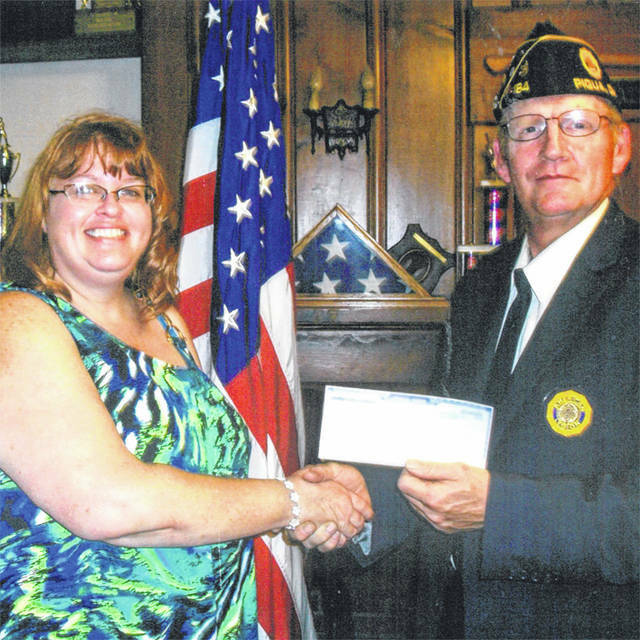 Provided photo Angel Turner accepts a scholarship from Piqua American Legion Post Commander Steve Mullikin. PIQUA — Piqua accountant Rex Wilson (1913-1984) was accepted as a student at Miami University after graduating from high school, but the timing just wasn’t right. He lost his college fund savings with the stock market crash of 1929 and the subsequent Great Depression. After high school graduation he sold shoes and worked with his father at a bookkeeping business. In 1943, he was off to World War II and did a stint as a Sea Bee in the U.S. Navy, where his unit monitored naval contracts to build ships. That day has come and Angel Turner, a student at Edison State Community College, is the beneficiary of a renewable scholarship in accounting. The award was presented on Aug. 27, at the American Legion in Piqua by the commander of the post, Steve Mullikin. President of American Legion Unit 586 in Tipp City, Turner holds three part-time jobs without benefits while raising funds for military veterans via the poppy program, an annual dinner, garage sales, and weekly cooking at the legion. Now that Turner’s three sons are adults, employed, and on their own, it is her turn for college, and she plans to become a tax accountant and then a tax attorney. Those interested in paying it forward by providing scholarship dollars may contact American Legionnaire Chuck Morris at (937) 214-4862 or Rick Hanes, vice president for Business and Community Partnerships at Edison State Community College at (937) 778-7806. A book scholarship to a worthy student is $500, and a tuition scholarship is $1,500. https://www.dailycall.com/wp-content/uploads/sites/30/2018/09/web1_News_AngelTurner.jpgProvided photo Angel Turner accepts a scholarship from Piqua American Legion Post Commander Steve Mullikin.